New availability graphs and reports, customization of the OSTRC Questionnaire, new video tutorials, new weekly data export. 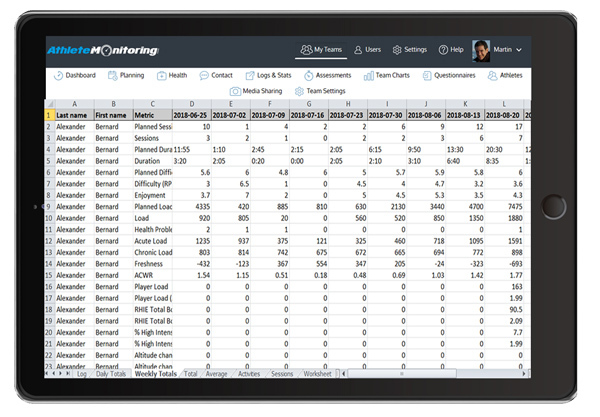 Here are the most recent features and enhancements we’ve added to AthleteMonitoring. We hope you’ll like them! Instantly see who is available to train and compete and who is not due to medical reasons, with this new availability report. To access this report, select the Team charts menu and open the Health section. The report also shows dates of return to partial and full training, as well as the date of return to competition (expected or actual). 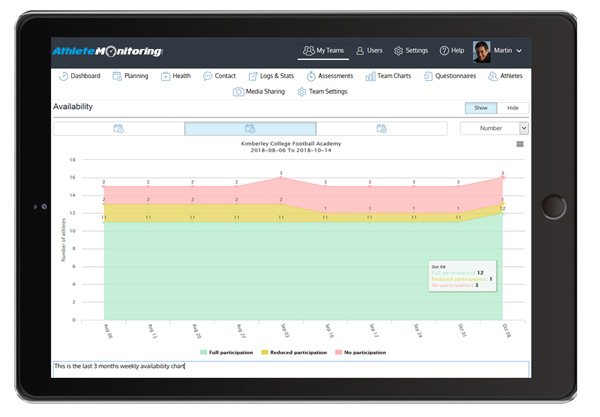 Monitoring squad availability over time is now a breeze, thanks to the new availability graph. To display these graphs, select a period, the type of data aggregation (day, week, month), the type of graph (percent or number of athletes), and get the big picture instantly. The OSTRC Questionnaire on Health Problems is the most accurate approach to detect and monitor injuries and illnesses in elite athletes. 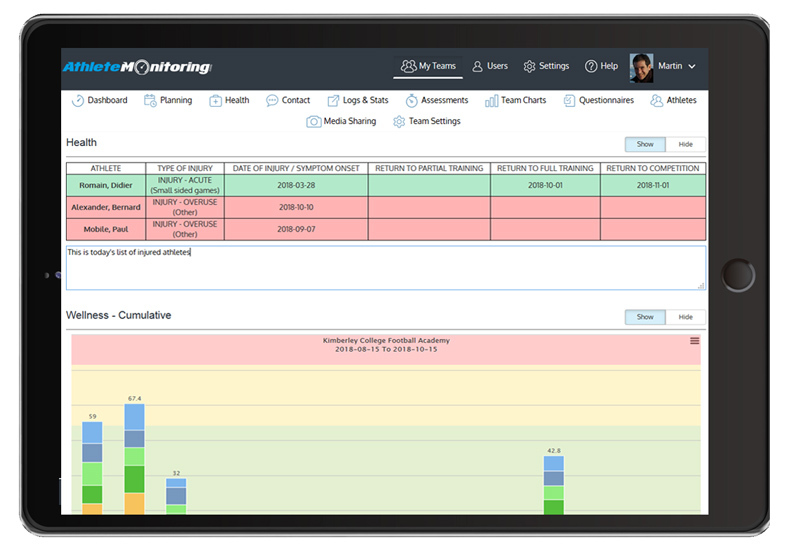 AthleteMonitoring allows you to use this new and validated injury surveillance method to monitor your athletes’ health, and even customize it with your own questions. To customize the OSTRC Questionnaire, open the Team Settings menu and the OSTRC Questionnaire tab. New questions are automatically visible on athlete apps. Collected information can easily be exported using the OSTRC Log from the Logs & Stats menu. You can now export all your raw training and performance data aggregated week by week in less than 10 seconds! Open the Logs & Stats menu, select Training Logs, Export, and open the Weekly Totals of the exported file. Medical notes can now be easily exported as a tab of the Injury Log export. To schedule an online demo of these new features, or if you have any question, please contact us anytime. We’re always happy to help!